The "everything included" 1984 Amstrad CPC 464 was worthy competition to the Sinclair ZX-Spectrum, Commodore 64 and other home micros of time. However it was lacking in one department. The default offline storage media was cassette tape which even at the time of release was pretty outdated. Disk (or as Amstrad called them, Disc) drives were becoming an affordable feature at that time even on home computers. Consequently, Amstrad responded to demand by releasing the disc drive-integrated CPC 646 in May 1985. This "transient" offering lasted just a few months before being superceded by the 6128 model shown opposite. How did the 6128 differ from the 464? First, the memory was doubled to 128 kilobytes, giving the machine its moniker. Gone were the coloured keys in favour of very light grey, which looked more business-like. Cursor keys were moved to the bottom and those, and the numeric keypad, were integrated into the main keyboard to reduce width. Most importantly, the 6128 (like the 646) was kitted out with 3-inch disk drives rather than a tape deck. Having a disk drive now meant the Amstrad CPC machines could load programs at speed, and its native AMSDOS did just that. That was not the only disk operating system on offer though. 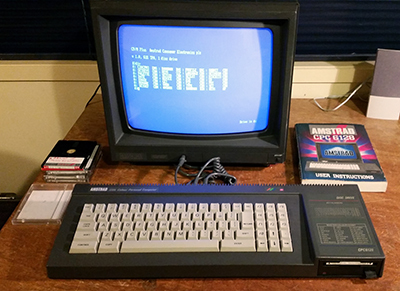 The popular 8-bit CP/M operating system (shown in photo) was also included along with a host of business applications for the "serious" user. This handsome 6128 was offered to me at price I couldn't refuse from another New Zealand collector. I love it. It came with an Amsoft joystick, a manual and a limited amount of software including the CP/M discs. The computer works just fine, with one exception. I won't write to disk. After some diagnostic digging I discovered this was because a small (easily lost) pin was missing in the drive. I've now got a replacement and will fit it when time allows. The Amstrad CPC 6128 is the machine of choice to play those cool Amstrad games.